So - the last few days have passed in a blur. From Wilpena we headed to Quorn and Wilmington where we refueled and made a detour to Alligator Gorge at the northern end of Mount Remarkable National Park. The road in is a steep roller-coaster climb - sealed - and with a sudden glimpse to the south west of a distant Spencer Gulf. Alligator Gorge is somewhere we'd visited in the past and is the terminus for a walk thru the national park to Mambray Creek Campgound - where we headed next. 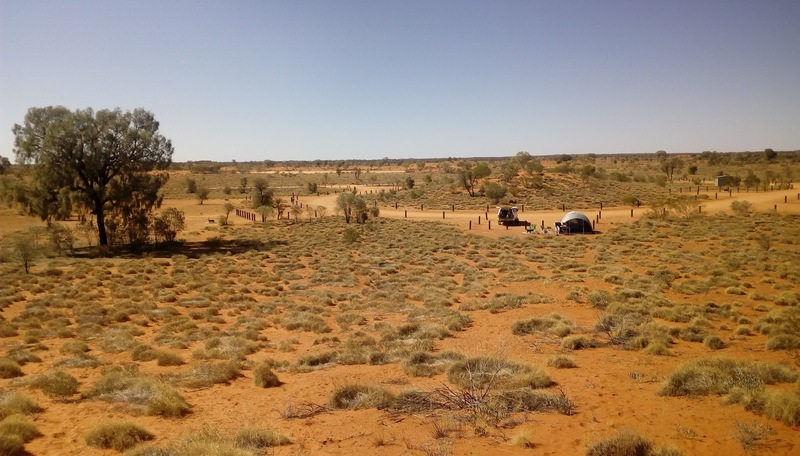 Next day - after handing over the rest of our firewood to Jock and Paula - they headed towards Port Augusta and then on to the Flinders - we headed south to Cystal Brook then east to Burra. The landscape on this section of the drive was remarkably green. Early wheat was sprouting in all directions, interspersed with bright splashes of yellow Canola. It provided quite a contrast to the overwhelming dryness we'd experienced over the previous weeks. Burra provided a dose of coffee and cuteness. Another country town that clearly depended on tourists/travelers to keep the place going. The creek flowing thru the town provided another splash of colour. From Burra - on to Morgan where we started following the mighty Murray River as is meandered across the land, leaving large isolated billabongs and wetlands in its wake. 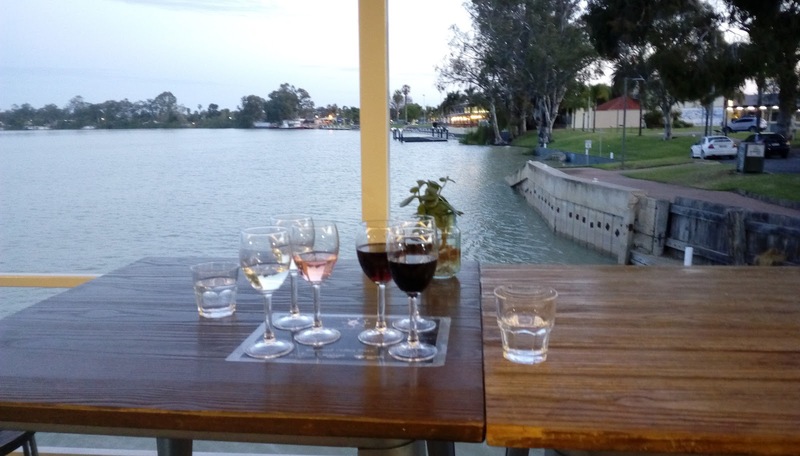 Berri for a late lunch and then to Renmark for the night. 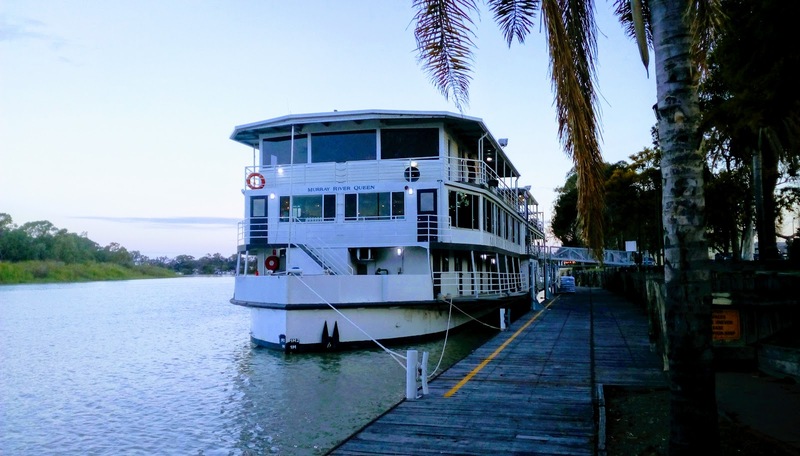 Cheap overnight accommodation at the Renmark Golf Resort and an excellent evening drink (or two) followed by Thai dinner on the Murray River Queen. 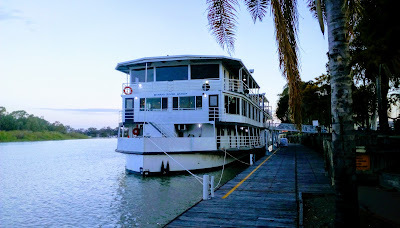 Next morning, after a brief pause in Renmark for breakfast we ploughed on eastwards. Overnight the weather had deteriorated, with a cold front moving thru and the promise of rain in the air. The grey weather combined with total immersion in our audio-book - The Little Drummer Girl by John le Carré - resulted in the km's unraveling at a steady rate. 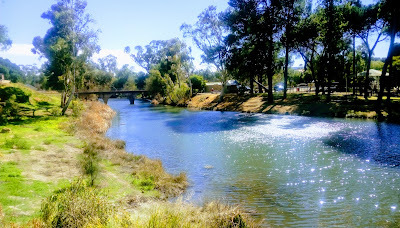 Mildura (stopping for bags of citrus) - Balranald (lunch) - Hay - and finally Narrandera where we called it quits for the day and booked ourselves into a motel that had a microwave, toaster and digital TV. The microwave took care of dinner and the toaster took care of breakfast as we consumed the last of our provisions supplemented by a few items from the supermarket and a six-pack from the Bottle-O. BTW - Narrandera has a special place in Celeste's heart. For a period of time she did a road trip for work thru the Riverina in a van full of ultra-sound equipment. And so - the final leg. A leisurely drive thru showers and rain - stopping in Junee to visit the Licorice Factory - yum. Again we were surprised at how green this stretch of road was. Must have had some rain over winter as the wheat was sprouting everywhere. Combined with the rain today - maybe farmers in this area will have a reasonable summer? Home in the rain - 9,920 km round trip door to door. Before departure I had estimated 10,000km. However the 80 km shortfall can be attributed to NOT visiting the Dinosaur Stampede site outside Winton - we will save that for next time! Tonight will be our 4th night in Ikara-Flinders National Park. From Leigh Creek we turned east into the Parachilna Gorge where we free camped up a creek bed off the road. Very quiet night under an almost full moon. 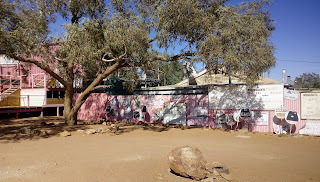 Next morning on to Blinman - an old copper mining town. Not much left of its past, just a few old buildings, signage and a pub. (Always a pub). There was also a bakery with fresh baked bread (white only), delicious cakes and passable coffee. Pics to follow as they need to be uploaded from camera as opposed to pics from phone. Slept under the open sky. No tent. Just our stretchers under the moonlight. Wonderful. I wonder if Heysen ever painted his eponymous mountains by moonlight? A drive thru and back again of Brachina Gorge, traversing a geological landscape measured in millions of years per kilometre. In the morning light with longer shadows an astonishing sight. Followed the back road to Wilpena pausing at Two Gums Lookout to admire the view. The extensive groves of native cypress trees and flush of fresh green grass providing an appearance almost at odds with what we normally expect from the Australian Outback. Wilpena Pound Campground for two nights. Hot showers, laundry facilities, cold beer and wifi - almost civilised. Tonight a Welcome to Country at the resort and a restaurant meal with the cold beer. Tomorrow back on the road towards Mt Remarkable and a (hopefully) rendezvous with Paula and Jock. They're heading this way but we (alas) are heading east and homeward bound. Can't believe it - we head bush for 3 days and emerge to find chaos in Canberra! By the time I post this Australia may well have a new Prime Minister - Yipee! South of Alice we overnighted at Rainbow Valley Conservation area. A few day trippers but only 1 other camper at the official campsite. Lovely spot and spectacular colours as the sun set. We has thought of heading further east on dirt and working our way down to Oodnadatta via Mt Dare, but after some thought decided to press on south on the sealed road to Marla and taking the track from there. Bush camped on a dry creek bed half way between Marla and Oodnadatta. Only people there, but clearly a well used camp spot. 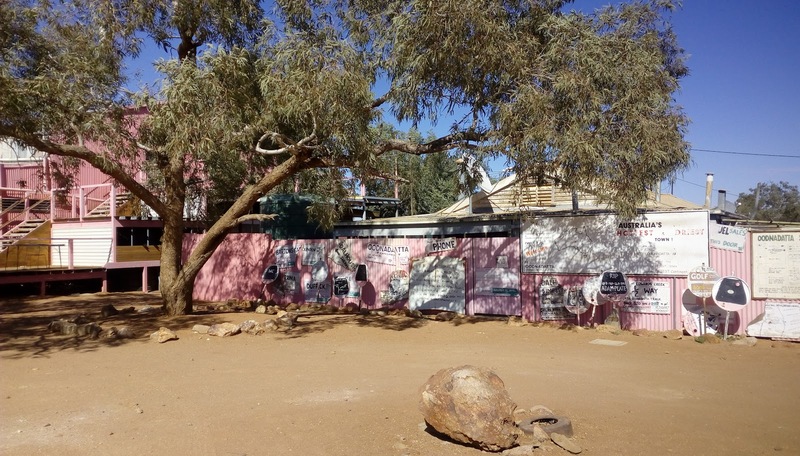 In the morning, continued to Oodnadatta and the Pink Roadhouse. for morning coffee and a look around. In retrospect, this stretch of the track was the roughest - lots of gravel washouts and a couple of areas of soft sand. Nothing major, just the need to drop our speed to below 50km/hr. The predicted front moving thru SA was making itself felt. Strong gusty wind - cold and from the west. Saw our first clouds in many days. 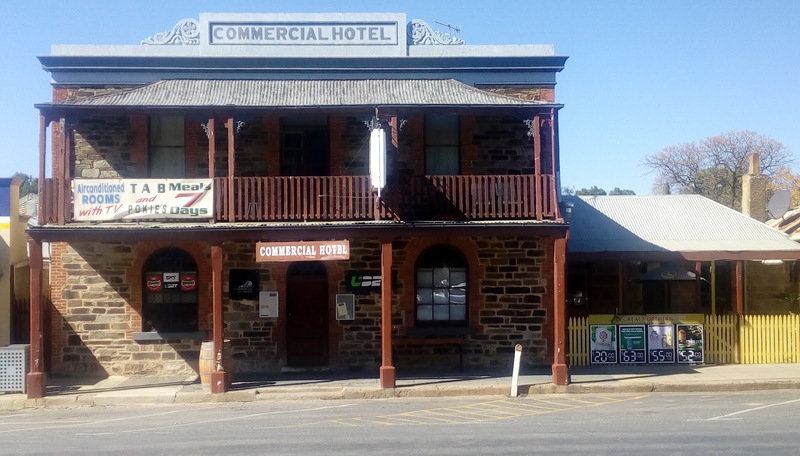 By the time we got to William Creek - the wind was strong and cold and we did not need much persuasion from the William Creek Hotel owner to take up his offer of a discounted price for a donga with en-suite and access to the laundry in the campground. We had been think of pressing on to Coward Springs - another hour and a half down the track but decided to enjoy the facilities at the hotel. This was a good move - the wind continued to blow strong and cold, the room was small but adequate with a bonus TV. We enjoyed the meal and cold beer and the chat with fellow travelers. We did briefly toy with the idea of taking a joy flight in the morning but the wind was still strong, and there was some low cloud about. In fact there had been a few drops of rain overnight but nothing that would register in the gauge. On to Coward Springs where we stopped to have a look around. This is a lovely oasis in the middle of nowhere and would be a great place to spend a night. It is clearly popular so I think the trick would be to arrive BEFORE lunch to ensure you got a good spot. 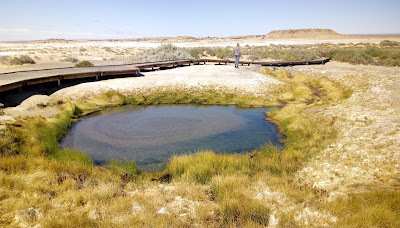 A few km further are some examples of Mound Springs - a surreal sight in the midst of the surrounding landscape. What amazed me the most was how high they were in comparison with the ground level. Clearly many thousands of years of build up of the mineral contents of the water. It is hard to imagine what they must have looked like before white settles trashed them with their cattle and cutting of the the few trees that apparently were growing around them. Bastards! It will take many thousands of years for the landscape to recover and already the flow from these mound springs is decreasing as the water is pumped from artesian wells across the basin, The aquifer is not being recharged as fast as it is being exploited. The mound spring known as The Bubbler once spouted a few meters out of the ground. Now it is just an occasional burp of muddy water. Still impressive in its context. And so on to Marree and the end of the track. 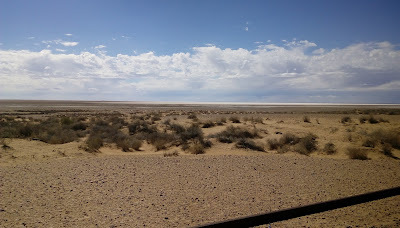 Stopping only to gaze out towards the southern end of Lake Eyre. Marree for lunch and then on the Leigh Creek for the night. This is a dying mining town with heaps of underutilized infrastructure. A sad waste. I'm taking advantage of the free WiFi at the local school where pupil numbers have dropped from hundreds to just a handful. Today - off the the Flinders - just down the road. The less said about Tennant Creek, the better. On to The Alice, stopping at Karlu Karlu aka The Devils Marbles. A gentle stroll to enjoy the landscape then a few km drive to The Devils Marbles Hotel for coffee. Pressed on to Alice arriving late afternoon at Wombats. A weekend full of activity. Henley on Todd Regatta on Saturday afternoon followed by Australian Ballet production of Coppelia at the Araluen Arts Centre. Sunday markets in the mall followed by a trip out to the Desert Park. Dinner with neighbours including 4 people who work at the Araluen Centre. Two of them had been instrumental is us obtaining free tickets to the ballet. Praline with Macadamia Nuts aka dessert. Tomorrow we go bush again. Heading to Rainbow Valley Conservation Area for the 1st night before tackling the Oodnadatta Track and heading for the Flinders Ranges. Blogging will be limited to when we have mobile phone coverage. After a relatively easy start to the day we left Darwin and headed down the highway. 1st stop Edith Falls for a swim and lunch. We had thought we might overnight here, but given the distances we need to cover to get to Alice Springs we opted to press on to Bitter Springs. 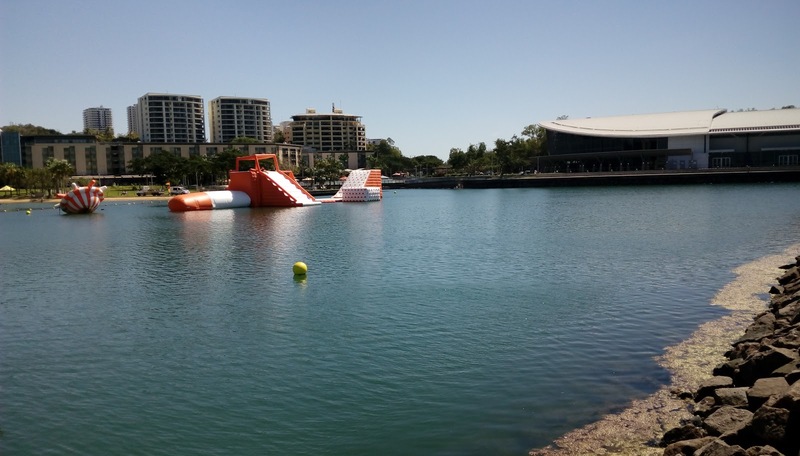 This would allow us the indulge ourselves in the springs and mean we could then press on to Tennant Creek the following day. On the highway we encounter heaps of bikes heading north. Its the Black Dog Rally. We pull off the highway to visit Daly Waters and find about 50 bikes pulled up outside the pub. So our brief 2 day sojourn draws to a close. I'm sitting out on the back verandah at Jock & Leslie's house, which backs onto the RAAF base at Darwin airport. Yesterday afternoon and evening and this evening as well, the air is periodically rent asunder by the sound of jet engines as the RAAF F/A18's and aircraft from other nations take part in Exercise Pitch Black 12. Good to see/hear our tax dollars at work. We've had a pleasant break from travel and camping for the last two days, but tomorrow will start heading south to The Alice, and the homeward leg of our travels. Yesterday we sought out good coffee in the am and then had a look at the Telstra Aboriginal and Torres Strait Islander Art Awards at the NT Museum and Art Gallery before seeking out some sushi. A lazy afternoon doing some washing, reading and a swim in their plunge pool before a quiet evening at home sharing a meal with our hosts. 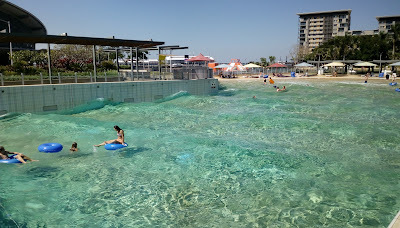 Today - a quick walk around the Darwin Waterfront, taking in the Wave Pool and Stokes Hill Wharf. We decided to take in a movie - suffering as we are from MDS - Movie Deprivation Syndrome. 2 hours in air conditioned comfort was welcome and the movie - The Wife - was superb. Highly recommended. Back to J and L's place to start packing for tomorrow. At their gate we encounter their son Elliot - clearly distressed and holding his arm in obvious pain. It turns out that he came home, forgetting that yesterday they had "acquired" a new dog that they are going to be looking after while the owner is away. Based on the evidence, the dog - clearly feeling abandoned and not really recognising Elliot - jumped out of the shadows, snarling and causing a startled Elliot to jump back, stumble then trip and fall on his arm before fleeing from the front garden back to the safety of the street. Celeste examined his arm and judged it broken. So a call to Jock who returns home and takes Elliot off to hospital where the break was confirmed and poor Elliot awaits having it pinned and set. When Leslie gets home from work, Celeste drives her to the hospital where as I write this, they all remain. On the bright side Elliot is bound to have at least a couple of days off school as well as the consequential bragging rights about how he was set upon by a ferocious hound and barely escaped with his life! The down side is I'm home alone with only the sound of F/A18 Hornets doing "touch and goes" as they perform endless circuits around the house for comfort. That and a cold beer. 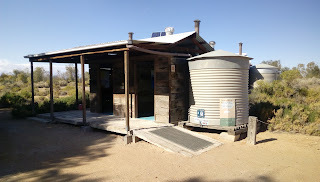 Departing the salubrious Barkly Homestead we continue West another 200km before reaching 3-ways. Here the East-West Barkly Highway meets the South-North Stuart Highway. Some sort of milestone or intermediate goal is reached. A brief stop at the 3-Ways roadhouse for expensive & mediocre coffee and expensive fuel. Then we press onwards and northwards. Easy driving on cruise control set at 115km/hr - way under the 130km limit. You can tell the NT drivers, they're the ones who pass you doing 150km/hr. Roadside lunch at Elliot amongst the peacocks. Making good time we decide to head for Mataranka and Bitter Springs. In the end - after 8 hours on the road, we've covered 740km - our longest day yet! Set up camp in the caravan park and then the short stroll to Bitter Springs. Another remarkable place to add to our already impressive list. The same aquifer that feeds Lawn Hill Creek and the Gregory River over in Quuensland is responsible for the springs in this area as well. They emerge from the ground at 33 degrees, crystal clear and wander gently thru the bush. Perfection after a long, dusty day on the road. Drop in at one spot and then drift gently with the current down stream where you can climb out via a convenient staging point. You then wander back up the concrete pathway to the start and repeat the cycle. This morning, after breakfast and packing up, we return for a morning bath. In the early morning light with even fewer people the experience is even more pleasurable. 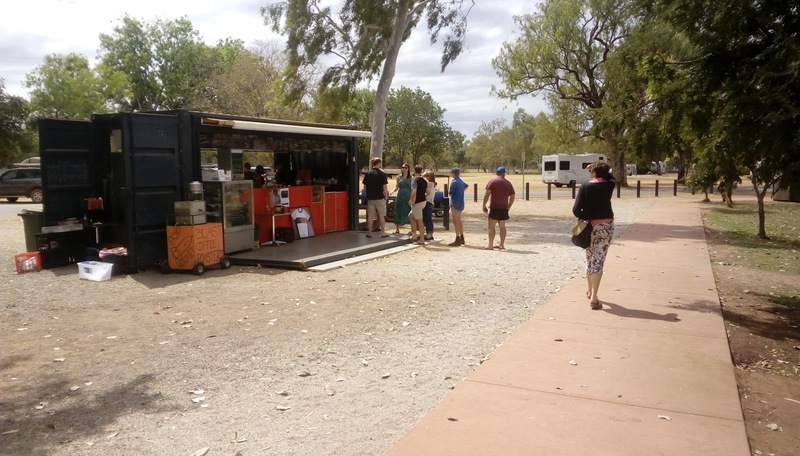 Back on the road, pausing in Katherine for coffee at a trendy pop-up cafe on the river bank. (Yes - the Melbourne Hipster Apocalypse has reached Katherine!). Still - the coffee was excellent and at a more reasonable price. A quick supermarket shop for picnic lunch and on to Edith Falls. This has to be amongst our favourite places - another idyllic swimming place. Clearly it's fame has spread and the caravan park has already full, with the campsites rapidly filling. We will return later in the week and should be there by late morning, hopefully ensuring we get a campsite. And so to Darwin, arriving late afternoon. A few days of R&R before we contemplate the road south to The Alice and beyond. Sitting in comfort in our motel room at Barkly Homestead - with full belly and slaked thirst. Yesterday morning we broke camp at Adels, and headed back into Boodjamulla for a canoe trip up the Lawn Hill Gorge system. 2 Hours allowed us to paddle up the gorge as far as possible including a portage past the Indarri Falls. A lovely way to spend 2+ hours, amazing red cliffs and rocky bluffs, vivid emerald lush creekside vegetation, crystal clear water teaming with fish, abundant bird-life and a bonus sighting of a fresh water crocodile that swam right across our bow! A final swim and lunch and we bid a reluctant farewell to Lawn Hill - well worth the effort of getting here. On down the Riversleigh road to the Miyumba Bush Camp, about 50 km of "shake rattle and roll" gravel south of Lawn Hill and 4km past the Riversleigh World Heritage Fossil Site. Only 2 other vehicles - so a complete contrast to Adels Grove. My favourite camp site to date. Minimal shade, dry scrub although only 300 meters from the Gregory River. Tank water and a single composting toilet and no fires allowed. Perfect. We set up camp and sat out the hotter hours of the day. Again - heaps of birds. Some eucalyptus trees were in full flower attracting swarms of insects and providing a plentiful food supply to swarms of Wood-swallows.Also lots of smaller birds feasting on the abundant grass seeds. 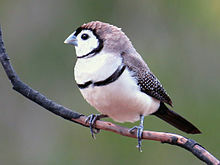 Including this little beauty - the Double Barred Finch. A stroll down the road to the causeway across the Gregory River - which just like the Lawn Hill Creek, is saturated with Calcium Carbonate. Apart from providing the vivid colour, it precipitates out of the water on any obstacle, creating extensive beds of tufa limestone that block the flow of the river creating ponds and billabongs on the flat landscape. The river bank is dense with giant paperbarks and other remnant rainforest vegetation. Also birds - did I mention the birds? A late afternoon drive back to the Riversleigh Fossil Site provided a pleasant afternoon walk in an amazing landscape. Anybody expecting to see lots of fossils lying about the place would be very disappointed. The limestone formation that holds the famous fossils runs for kilometers and the 800 meter walk only has a couple of modest examples. No doubt that if you were intrepid enough you could follow the limestone ridge, hammer in hand (strictly illegal) and find plenty of amazing examples. Apparently the best place to see Riversleigh Fossils is in Mt Isa where there is a dedicated display. Back to camp for dinner. As the night darkens we are blessed with clear skies and starry wonder. Planets, satellites, shooting stars in a deep silence broken only by the distant sound of the Gregory River cascading over the causeway. And so to bed after another day of wonder. Dawn and the last fading sliver of the moon greet our awakening. Another 80km of gravel road before we reach bitumen and then down to the Barkly Highway pausing in Camooweal for coffee and an early lunch. Across the border into the NT and 260km blast (130km speed limit) to Barkly Homestead. 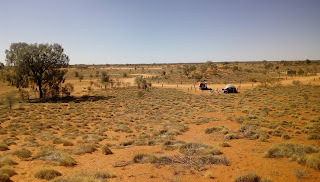 Australian Outback Roadhouse - in the middle of nowhere - and find it full of fellow travelers, from every corner of the country and planet, happy to share this uniquely Australian experience. 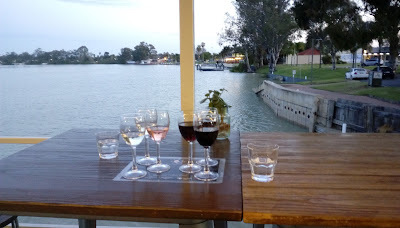 A swim, a hot shower, happy hour in the pub - complete with live musician - dinner and the ritual of downloading photos from camera to laptop, then uploading pics to the cloud (internet connection permitting) and knocking out this blog. What fun! Tomorrow onward to Daly Water - or that general vicinity.